Six of us had to go home after two nights… Look how triumphant they look! Actually, the goal of us Mode 1 Hikers was not “let’s just get there”, but rather to experience ourselves traveling through and within the nature on a macro level. We didn’t look at the pieces so much as we looked at the whole. We each commented on feeling in “the zone” as we strode along. 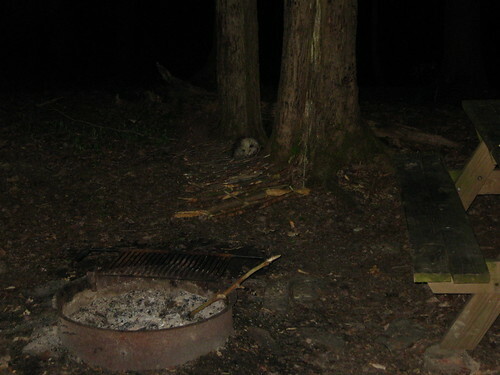 And, hey, it was probably nice to stroll into camp with the fire already lit! Yes, ladies, it was very nice to stroll into camp with the fire blazing. Thank you for that! Perhaps if I were in better aerobic health, I could have kept up with you and experienced the zone! At any rate, I was sad to say goodbye to the Six. Many thanks to you all for being a part of my trek! Can you even see me next to that root mass? 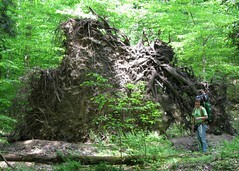 I always wonder what it would be like to be in the woods when the wind is strong enough to take down a tree like that! 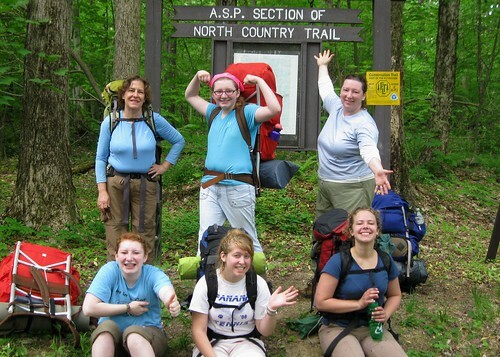 This entry was posted in camping, hiking, mammals, porcupine. Bookmark the permalink. looked like soo much fun! 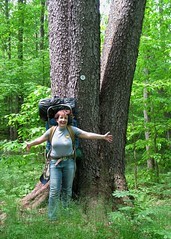 I did not know there were multiple modes of hikers. I wonder which I am. Ha ha… I didn’t even tell you about Nick. There is another mode: speed hiker! Nick walked in one day the same distance that took us two.